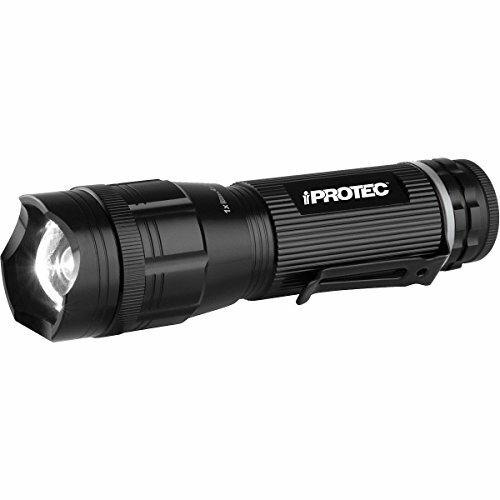 This heavy-duty iPROTEC® Pro 250 Lite™ flashlight features a self-defense face and aircraft-grade aluminum for ultimate durability. Its magnetic base and steel clip allow for hands-free use, while 5 light modes and 4x zoom let you choose the brightness and range. Water-resistant design. Anodized aircraft-grade aluminum body. Magnetic base. Steel clip. Aggressive self-defense face. Convex lens. Heat-sink bezel design. Rear glow-in-the-dark button. 4x adjustable zoom. 5 light modes with smart-select dial. 100% Light: 250 lm; 160 m; 240 minutes . 50% Light: 125 lm; 69 m; 480 minutes . 10% Light: 25 lm; 31 m; 900 minutes. S.O.S. : 250 lm; 160 m; 4320 minutes. Strobe: 250 lm; 160 m; 4320 minutes. If you have any questions about this product by iProtec, contact us by completing and submitting the form below. If you are looking for a specif part number, please include it with your message.